Thanks for your suggestions and votes for holiday knitting projects. I did actually take your advice, but there is little evidence, as there hasn’t been much knitting going on so far. I have a few excuses though. I’d been so ridiculously busy at work for the fortnight before I left that even thinking about knitting was too much hard work. I took my knitting on the plane (of course) but was far too tired to do a thing. I suppose travelling to the other side of the globe will do that. And then upon arriving in Melbourne, I was far too busy doing Melbourne things, indulging in the local attractions. Case in point: the fabulous Kylie and I went for the most fabulous meal at Mamasita. I cannot rate this place highly enough. Impeccable service, very yummy drinks, and fabulous Mexican food. I arrived early so perched myself at the bar, and the staff were fabulous, giving me both enough space when I deliberated over the drinks menu (I started with a tasty sangria) but then sweetly offering me magazines to read when it was clear that my companion *cough* was a little late. Oh, if only I could live on caipirinhas, I would. Completely delicious. Tostaditas and tacos. (I had the Enchilada y mole verde, which wasn’t so photogenic, but was incredibly delicious). Judging by the queue out the door, this place is hardly a well-kept secret, but if you go in early (say, 5.00pm) or go for lunch, you might be lucky enough to score your choice of seating. If you’re in Melbs, I’d highly recommend this place if you fancy something a bit nice. One of my little quirks is a strange fascination with buttons. I remember as a child spending hours playing with my mum’s (very small) button collection, having such a great time rearranging them, sorting them in to different groups according to colour, size, etc. Since I started knitting a few years ago, my interest in buttons seems to have renewed itself, and my button stash now rivals my yarn stash. In my crafty travels I have to incorporate some button shopping, so here’s the rundown of Melbourne (Tokyo button shopping adventures to follow). I made a new button source discovery, and visited an old favourite. Surely this is one of the best shop doors ever? This is the entrance for Jimmy’s Buttons at 375 George St Fitzroy, a new discovery of mine, found through one of my favourite blogs, Craft City Melbourne. The set-up is pretty basic and very much has a factory store-front feel. The left hand side of the shop is dedicated to tubes and boxes of buttons, but I was surprised that the majority of the store is actually dedicated to various ribbons and trims. After a bit of a rummage I found some buttons that I wanted to buy, but the member of staff was particularly engrossed in speaking to a regular, so after quite a wait (and feeling somewhat like chopped liver) I decided to leave empty handed. My last day in Melbourne was spent with the awesome Kylie. We started off the day with the most delicious bagels and Vietnamese iced coffee (I was so excited, as I’d never had one outside of Vietnam before!). One of my must-dos was to have a rummage in the gorgeous Nicholas Building, surely my favourite building in Melbourne. After visiting the wonderful Kimono House, we hit Buttonmania, without a doubt the best place for buttons in the whole of the city. We had a great chat to the owner Kate. Turns out that she was hosting one of her amazing sales the following week (damn!) so we got a sneak peek at a small selection of what would be on sale. Kate had somehow purchased a whopping 12 crates of depression-era buttons from Brazil. She had only opened one crate so far, so we got to check out the gorgeous buttons that were inside that one crate. I could only imagine what the other eleven might contain! I can never leave Buttonmania empty-handed, so walked away with a few vintage beauties. One of the best elements of the Nicholas Building is the original rickety elevators (including one that still has an attendant) so even if you’re only heading up a couple of floors, I’d highly recommend catching the lift. Just to add to the fun, Kylie and I briefly got stuck, but only because we’re a bit rubbish at operating the thing. Hint: don’t be afraid to press the red button! 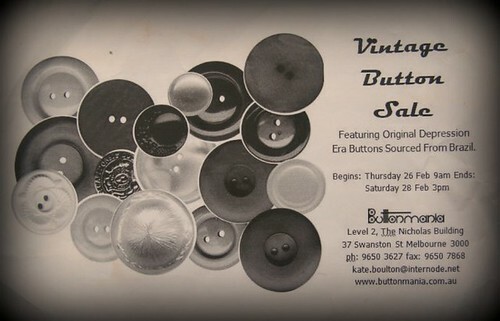 If any of you Melbournians made it to the buttonmania sale, I’d love to hear about it. After arriving in Melbourne in the middle of the night, and then spending that night sleeping in the world’s noisiest bunk bed at a hostel, my first day in the city was dedicated to doing as little as possible. The first chance I got, I found a patch of (semi-green) grass and flopped down for a snooze. Words cannot describe how amazing it was to feel warm sunshine after so long in grey London. I took a picture to commemorate the view of my first day in Melbourne and then promptly fell asleep. Bliss. There has actually been a bit of knitting and craftiness going on since I arrived in Australia, and I’ve since left Melbs for other sunny parts of the country. More posts will be forthcoming when internet speed allows. I arrived in the middle of the night to quiet, familiar streets. I walked through the city to the hostel and breathed in, remembering that smell – it’s the smell of home.